PediaSure’s complete Balanced Nutrition® is formulated to help kids who are at nutritional risk to grow and gain. 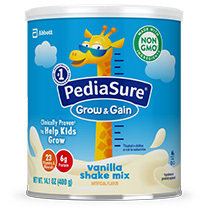 § Per 8 fl oz serving, PediaSure with Fiber has 9g total fat. || When 1/3 cup powder is mixed with ¾ cup 1% milk.